Tiger Shovelnose Catfish: Care, Size,Feeding,Tank. Complete Care Guide. Blog Tiger Shovelnose Catfish: Care, Size,Feeding,Tank. If you have space and want a show-stopping freshwater fish to wow your friends then you need to buy a Tiger Shovelnose Catfish(Pseudoplatystoma fasciatum). Without doubt, these fish are amazing and in the right size aquarium can look amazing and thrive in the home aquarium. Also known as Tiger Catfish these fish come from the rivers in South America and can be found in Brazil, Peru, Venezuela, and Paraguay. In the Amazon, it is considered a sports fish where they are fished and also eaten by locals who report them to be very tasty. They are very large catfish that can grow to over 4 feet in length in the wild and in a home aquarium they often reach between 2-3 Feet given the right size tank, water conditions and food. Tiger Shovelnose Catfish are highly active fish, and a tightly covered aquarium lid should be used at all times to prevent it from jumping out of the tank. Choose their tank mates wisely as these large fish can get a bit boisterous and often knock other fish around the tank especially when feeding. They will also make short work of very small fish and will see them as lunch! Let us have a look in more detail at this amazing fish in our complete guide to keeping Tiger Shovelnose Catfish (Pseudoplatystoma fasciatum). Tiger Shovelnose Catfish are amazing fish that grow very large but also need some special tank requirements and conditions to help them thrive. Here’s our complete guide to keeping one in a home aquarium. Where do Tiger Shovelnose come from in the wild? These impressive catfish come from the rivers of South America where they can grow to an amazing 4 Feet in length and have a voracious appetite. They hunt in the dark, murky waters by using their very long whiskers. These fish tend to stay in the main rivers at deep depths but have been seen in shallower waters in lakes and flooded forest areas. Their natural instinct is to be on the lookout for food in dark and concealed places where they lay in wait ready to ambush any unsuspecting prey. Juveniles seem to prefer flooded forest and shallow lakes with adults preferring to live at deeper depths in the main rivers and streams. In the wild, these fish can live to around 20-23 Years but in captivity, it’s more like 18-20 Years. Fed correctly they can grow 12″ every 2 years reaching their full length in around 5-6 Years. This is only achievable if you have a big enough tank and feed they a variety of meaty foods. Most people simply don’t have the room for a suitable tank and often get rid of their fish at around 3-4 years. Tiger Shovelnose Catfish are they aggressive or peaceful? Tiger Catfish have very large mouths and can easily eat small fish. They do, however, rarely eat their tank mates if kept well fed. Tiger catfish are very active fish and can accidentally hurt smaller fish with their fast-paced, active behavior. You would be forgiven in thinking a catfish of this size would just sit at the bottom of the tank but not these monsters! They love nothing better than swimming around the tank looking for food. If your Tiger Shovelnose is sat around not doing much and being very inactive then your tank is too small or it’s sick. When these fish are healthy and well fed with plenty of space they should be swimming all over the place. That’s why it’s important to have a tank 180+ gallons minimum for juveniles and for larger fish you’ll need a huge tank! Their important antenna is vulnerable to damage from other fish like Oscars and other large fish like Pacu. However, don’t be too worried if they get damaged as they can grow back within 6-9 Months. They are well known for jumping out of the tank accidentally so ensure you fit a secure lid. They don’t do it to escape they simply get over excited and jump out. I had the unfortunate experience of this when my 4 large Pacu’s which were approximately 14″ each in size started to chase my Shovelnose Catfish around the tank nipping at his fins. In his attempt to escape them he jumped up knocking my light and flimsy lid off the tank and he ended up down the back of my tank. I struggled to get to him and unfortunately, he died around 30 minutes later after I had retrieved him. I later replaced him with a Red Tail Catfish which is another monster catfish. My tank was over 200 Gallons and I replaced my lid with a more suitable tight fitting hood. He was housed with Oscars, Pacu and 2 Large Plecos. I later went on to replace my tank with a 350 Gallon tank as they outgrew the 200 Gallon tank very quickly. Tiger Shovelnose Catfish have a long and slender body with a beautiful silver and black coloration along with black stripes and spots covering the entirety of the body, which gives them a tiger-like appearance hence their name. Their mouths are large and flat which they use to grab unsuspecting prey. They use their long whiskers to sense touch prey which helps them hunt in the dark muddy waters of South America and in the well planted and dark Amazon rivers. These fish are often purchased and seen in aquarium shops for under $50 at around 3-4″. They look cute and unassuming but don’t be fooled, these fish are monsters and grow at an alarming rate. The Tiger Shovelnose Catfish is a big predatory monster of a catfish that should only be kept by an experienced aquarist with a truly large aquarium. Any fish small enough to fit in the Tigers mouth is prey so choosing their tank mates carefully is a must. In the wild, they hunt native fish and any crustaceans that will fit into their mouths. These fish get very anxious from time to time and react by splashing around and becoming very active. This is their way of showing contempt for other fish. In this display, they can harm and hurt other smaller fish so housing them with similar size or hardy species is advised. Apart from the obvious need of housing them in a large 180+ Gallon tank they also need good filtration as their diet can be messy. We like large external canister filters like the Marineland C-530 150 Gallon External Filter suitable for 150+ Gallon tanks. You’ll need 2 of these at least for such a large tank. Uneaten fresh fish and meaty foods soon make the water poor quality and regular water changes are advised. It is also advised to remove any food that is not eaten within 5 Minutes. You will need to change around 25% of the water each week to ensure top quality water for them to thrive. Try to recreate their natural environment in your home aquarium by using Large Bogwood, plants, and rocks to ensure they don’t get bored or stressed. As responsible aquarists, we have a duty to give them the best aquarium, best foods, best water quality and best environment possible. Pay careful attention to the water quality: 75-82° F, KH 6-20, pH 6.0-8.0 should be achieved. Use a good pH test kit to establish what your pH is which will help you control the levels better. Remember to fit a tight lid as these fish often jump out of the tank! Whatever decoration you use, ensure it is large enough not to be thrown around the tank when they swim. They have been known to smash 1/4″ Glass with rocks and driftwood which we purchase from Chewy.com, One of the biggest aquatic online retailers. Most tanks of 180 Gallons or more will have 1/2″ glass so you should be okay as long as the decoration is secured in place. If your catfish outgrow your tank you will need to look for a suitable new home, most zoos and public aquariums won’t take them anymore so finding a home for these huge monsters might not be easy. They should never be released into the wild unless you live in South America. It is a skilled predator that can disrupt the native ecosystem. One of the saddest things we witness far too often is people keeping these wonderful fish in a small, bland and empty tank which offers no stimulation at all. They then get stressed and start to be become lethargic and stop eating. This will only lead to their slow death. What do Tiger Shovelnose Catfish Eat? Feeding the Tiger Shovelnose Catfish is not difficult at all due to the fact that they are not a picky eater. In the wild, this fish will eat local native small fish and crustaceans. In the home, aquarium feed them an assortment of worms, frozen foods, Extra Large sinking catfish pellets, and dry foods will provide the proper nutrition. They can also be fed slices of fresh fish. Never overfeed your catfish, we know it’s an awesome feeling feeding a huge catfish but they can also be easily overfed. Overfeeding your fish is also the number one cause of poor water quality. If you accidentally overfeed your fish then ensure you perform a large water change as soon as possible. How to do this can be found in another one of our articles which we have linked above. Some owners have even trained their fish to feed from their hands, not something I ever had the nerves to do but I’m sure it’s an exhilarating feeling doing this. Can you breed Tiger Shovelnose Catfish in a home aquarium? Very little is known about the breeding habits of these fish in the wild and as far as we know there have been no reports of them breeding in a home aquarium. We have heard of them being bred in zoos but we couldn’t find any documentation to support this. It fair to say you would need a huge aquarium at home to even contemplate breeding these fish. 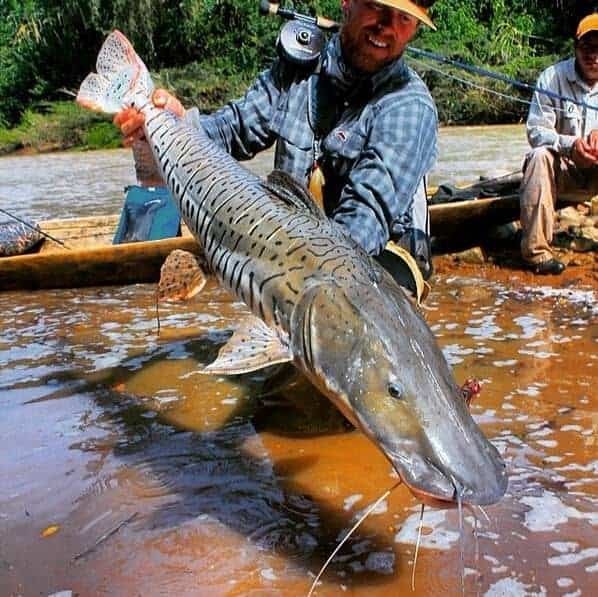 It is said that fishermen have caught pregnant Tiger catfish in South America and the females are much large and have an overall more rounded body shape. Trying to find a suitable pair and sexing these fish would be the most difficult part of the breeding process in a home aquarium. We are not even sure at what age and size they start to breed but suspect that it will be at maturity which is about 3 feet in length. If you know of any successful breeding programs in captivity them please let us know. We hope we have given you some useful information so you can make the right decision on purchasing one of these amazing fish. The number one fact you need to remember about these fish is that they grow large very quickly. We don’t want to put anyone off keeping one of these fish but it wouldn’t be right to buy one and not give them the best environment possible. There are many great large catfish available to buy but these are certainly one of the best! There will always be the argument that these fish are simply too big for home aquariums and that is a genuine concern. You will need to be able to upgrade your tank constantly as they grow and have a longterm plan for when they outgrow your home. ( Which they will! ). This argument can probably be said for a lot of fish that are for sale to the public and you have to make that call if you should keep them at all. They will always be available to the public for sale but should you buy fish that grow so large? I’ll leave that question for another day. Happy Fishkeeping Forever, Let us know how you get on.